« Promotional cable rates rule! Actually, it’s called the Tumbleweed Tiny House. My friend Rob left a link to the website in my comments and I’ve been meaning to bring it out to main blog status. 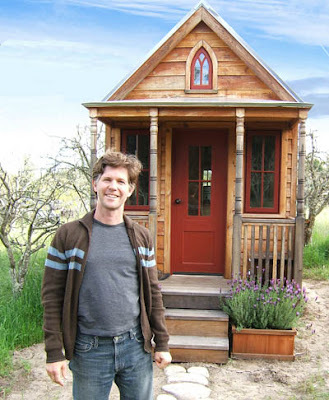 The guy above, Jay Schafer, decided he wanted to have a little of an impact on the environment as possible when it came to living space, so he decided to build his own “Tiny House.” It’s a whopping 89 square feet. You can link to a video tour of his house from the website homepage. He also has plans for larger Tiny Houses, with the largest at 837 square feet, and that includes three bedrooms. It’s pretty crazy. I couldn’t do it!